Chavín was once compared to the Olmecs and depicted as the Mother Civilization of the Andes. The term Chavín has been applied to a developmental stage of Andean history, to an archaeological period, to an art style and to a hypothetical empire. Chavín has been interpreted as a culture, a civilization and a religion. The idea of a Chavín horizon was proposed by Julio Tello. In the 1930s Tello claimed that Chavín was Peru's oldest civilization. His definition of a pan-regional Chavín culture included attributes of ceramics, architecture and sculpture. The incorporation of sites with some Chavín characteristics eventually led to a perceived culture spanning two millennia and reaching from Ecuador to Argentina. 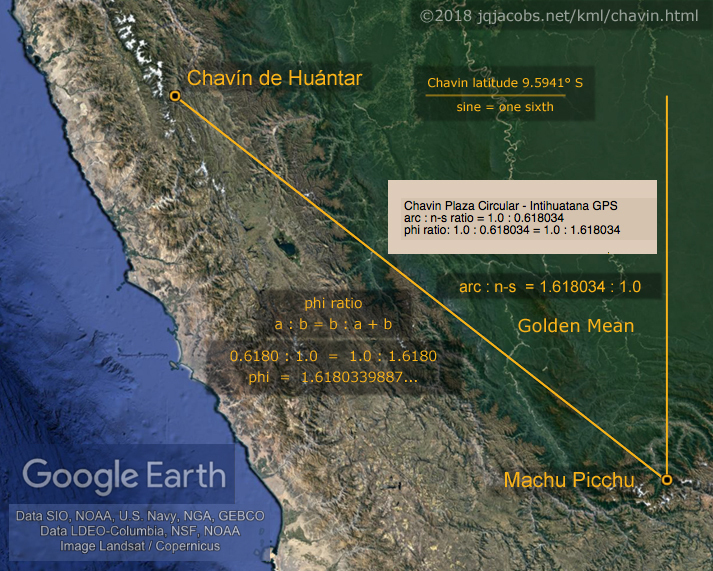 Tello's criteria has since been narrowed and recent research, especially radiocarbon dating, has refined understandings of Chavín and regional site relationships. In the 1960s John Rowe's Andean chronology defined the Early Horizon as the time beginning with the first appearance of Chavín influence in Ica. This arbitrary criteria requires a definition of Chavín influence and a clear understanding of the Chavín style horizon. The style can be unevenly documented on the coast from Lambayeque to Ica, and from Pacopampa to Ayacucho in the highlands. Adhering to Rowe's definition presents some problems. For one, new dates at Ica might change the Andean chronology. And, as has been subsequently determined, it also means that Chavín influence precedes the first sculptures at Chavín, the content of which defines the style, and precedes Chavín itself. There are several important areas to consider in assessing the role of Chavín in the origins of Andean civilization. Landscape context is an important aspect of all cultural development trajectories, and particularly so at Chavín. In early Andean communities dependence on more that one life zone promoted interaction, exchange and interdependency, a pattern first evidenced in the coastal valleys where the exchange pattern involved the series of elevation-stacked ecological zones beginning with maritime resources and extending inland to agricultural and pastoral habitats. An excellent example is found in the Casma Valley , at Moxeke, 18 km from the ocean, where almost all animal protein was maritime. Chavín civilization may be the best early expression of a similar pattern on a larger ecological scale, that of interaction between the three major ecological zones, the coast, the highlands and the tropical forests. Chavín de Huantár, the archaeological site, is uniquely situated in the region of the Callejón de Huaylas, where there are only two ranges in the Andes, rather than the usual three. The glaciated Cordillera Blanca has, in a 180 km long span, a few passes, all over 15,000 feet in elevation. Chavín de Huantár, midway between the coast and the jungle, is located on a route accessing the very extensive Marañon drainage. Almost all the large rivers of the central Andes flow to the Amazon drainage. The Callejón de Huaylas' Santa River drains to the coast, transecting the Cordillera Negra. Via the Santa Valley it is possible to cross the Andes by crossing only one high pass. Chronology is also significant in assessing Chavín's presumed influence. Tello considered Chavín to be older than the coastal sites with Chavín style, and viewed the stylistic evidence as indicating Chavín's expansion. John Rowe's 1962 stylistic seriation of sculpture and of Ica ceramics provided only a relative chronology for Chavín. 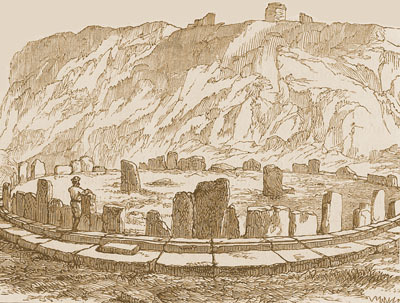 Peter Rowe's subsequent stylistic assessment of chronological placement of coastal and highland sites concluded that there was gradual expansion of influence from Chavín. In 1979 Burger clarified the ceramic sequence at the Chavín site, naming three sequential phases based on 11 stratigraphic excavations. Burger also analyzed 20 carbon samples, half each from the monument and the settlement areas. Radiocarbon measurements established an absolute chronology for Chavín de Huantár, spanning from 850 BC to 200 BC. By 500 BC Chavín de Huantár was a flourishing center double in size from the time of first construction 300 years earlier. Most of the construction dates to 400-200 BC. Around 400 BC the monument was remodeled and greatly expanded and the settlement increased to over 40 ha and about 1.2 km in length. Population may have reached 3000, making Chavín one of the largest highland centers in the Andes. Radiocarbon dates from coastal sites with Chavín style ceramics, sites that had been interpreted as provinces of Chavín, were compared by Burger. 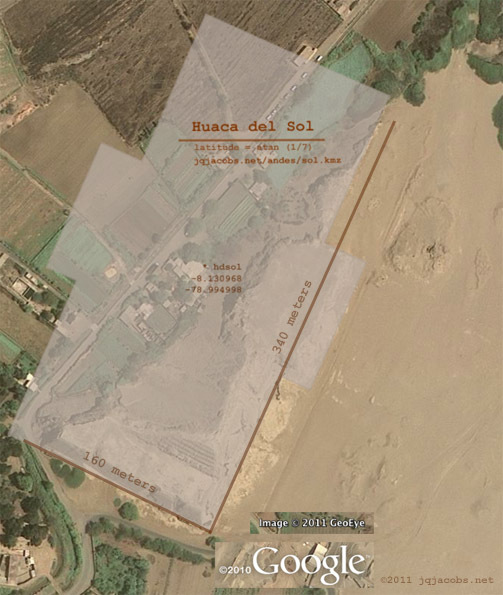 Three widely distributed major sites were selected, Las Haldas, Caballo Muerto and Ancón near Garagay. Monumental construction at Las Haldas dates from 1190 BC to 900 BC. At Caballo Muerto the constructions that resemble Chavín also predate Chavín, ranging from 1730 BC to 850 BC. The presumed Chavín influenced ceramic phases at Ancón dated from 1345 BC to 810 BC, with a mean of 1074 BC. These coastal monumental centers prospered between 1700 BC and 900 BC, while the earliest constructions at Chavín dates to about 850 BC. 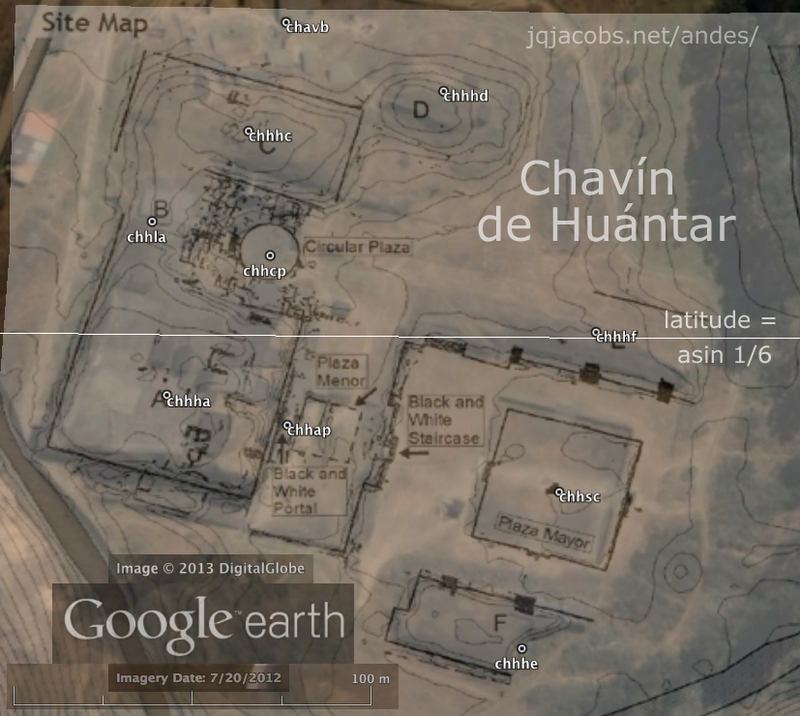 The coastal sites are older than Chavín. The architectural features and iconographic style at Chavín de Huantár actually developed elsewhere, and the direction of influence is the reverse of what was first assumed. Relative comparison of site size can illustrate or define possible relationships. The Chavín monument is less than one-tenth the size of Sechín Alto, in the Casma Valley. The Casma has the largest and most elaborate Initial Period constructions. The shortest route from Chavín to the coast, across the Cordillera Negra, descends into the Casma Valley. 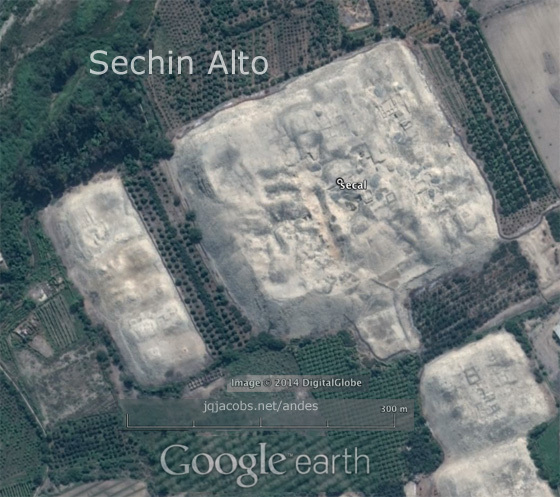 Sechín Alto covered 300-400 hectares, and it is just one of several monument precincts in the Casma drainage. Sechín Alto is also one of the largest architectural complexes in the world. The monument complex alone extends nearly 2 km. The entire community of Chavín would easily fit in Sechín Alto's central plazas. Also in the Casma Valley, Las Haldas covers about five times the area of Chavín. At Moxeke the monument complex alone extends over a kilometer in length, with 70 platform mounds flanking the sides of the central plaza. 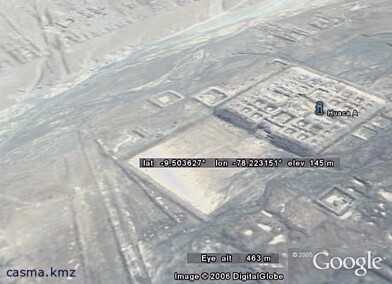 Other coastal monument complexes also greatly exceed Chavín in size. Of course, Chavín features unprecedented architecture due to its remarkable engineering, quality masonry and very fine sculptural stone art, in contrast to mostly earthen and adobe plaster over stone monuments on the coast. This may be a response to the local climate more so than an indicator of relative importance. Socio-political organization changes dramatically during the Early Horizon. One expression of the preceding Initial Period social pattern is found in the monumental architecture. Distinct style areas of monumental architecture are seen, with the central, north-central and the north Peruvian coast having distinct monument styles. Each of these zones were represented by a major site in Burger's radiocarbon comparisons. Early regional political relationships may be evidenced by these style zones and by concentrations of or by extremely large inland mounds in the Moche, Casma and Chillón-Rimac Valleys. 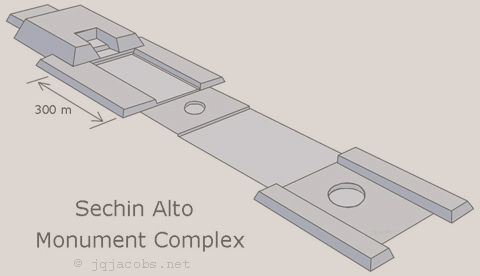 Sechín Alto evidences over a millennium of construction. There is little evidence of economic or social stratification during the early Initial Period in the Casma Valley. Evidence of some stratification is seen by the late Initial Period, with a difference in two groups of dwellings. Dwellings attached to the monument precinct were of more substantial construction. New social classes may have emerged by the end of the Initial Period, coincident with the end of massive public architecture projects. The first settlements to evidence social differentiation are the Preceramic sites of Rio Seco, El Aspero and Bandurria, communities of up to 3,000 population, a size comparable to the maximum at Chavín. Stratification is evidenced at Chavín in the settlement pattern. Rich burial accompaniments in northern highland areas during Chavín's last phase evidences status differences, reinforcing the status interpretation of the settlement differences at Chavín. Craft specialization also appears in households. The first evidence of urbanism and these social changes date to the last phase at Chavín only. Burger calls the site proto-urban at this time. Trade is an important factor in the development of Andean civilization. Interregional trade rose sharply during the Early Horizon. Chavín's interaction sphere, as a supra-political entity, is characterized by a new scale of interaction and exchange of goods and ideas. Exchange items included pottery, shell, stone resources, wool, textiles, metals, and dried fish. The more unified iconography may be related to this social change. Chavín's location allowed flow of and/or control of trade between major environmental zones. Long distance trade fueled Chavín's success and growth. Trade was dependent on llama conveyance. Domesticated llamas first appear with frequency at multiple sites outside their natural range during the Early Horizon. By 400 BC sophisticated economic systems involving distant trading had been established and roads were developed. The several regional spheres of interaction during the Initial Period became a single economic interaction sphere spanning nearly 1000 km, from Pacopampa to Pata de Huamanga, and including coastal, highland and the eastern Andean slopes. Studies sourcing obsidian evidence a sharp increase in long-distance trade. Obsidian from the Quispisisa source, 450 km south of Chavín, reached the northernmost extent of the Early Horizon exchange network. Of the three phases at Chavín, the final Janabarriu phase reflects the most extensive communication networks, when obsidian use at Chavín increased 500 fold. Products from Ecuador and Chilé found their way into the exchange network. At the same time the pattern of interaction is uneven, indicating local determinism. Technological innovations appear suddenly and diffuse over a wide area during the Early Horizon. In textiles, use of camelid hair in cotton textiles, dying camelid hair, textile painting, resist painting, discontinuous warps, warp wrapping, and the heddle loom transformed the Andean textile tradition. In gold metallurgy three dimensional forms, soldering, sweating, welding and silver-gold alloys appear. Wide distributions accompanied these technological advances. Chavín's elaborate iconography is found on hammered gold and textiles as well as on ceramics, stone sculpture and clay friezes. Chavín iconography represents an unprecedented unification of previously heterogeneous groups, yet without total cultural homogenization. A wide range of groups in the mid-Early Horizon modified traditional ceramic styles, yet the pottery continues to display regional style variations. In contrast, textiles of the Chavín horizon do not display regional distinctions in technology or style, and are therefore an excellent horizon marker in areas of good preservation. The Early Horizon panregional ideological codification reflects a shared ideology and a far wider group identity than during the Initial Period. Chavín de Huantár's iconography reflects an ideological system incorporating material from the tropical lowlands, the coast and the highlands. Nonetheless, the hypothesis emerged that Chavín's stylistic homogeneity, over a wider area than all previous cultural styles, resulted from a single point, rapid dispersal of the style. There was a long-standing consensus among anthropologists and archaeologists that Chavín style expresses a religious ideology and represents a religious diffusion. Rafael Larco viewed Chavín as a pilgrimage center erected by members of a feline cult. Rebecca Carrión called the Chavín empire a religion that spread a homogeneous art style. Gordon Willey interpreted the diffusion as a peaceful spread of religious concepts. The basis of these assumptions, rapid dispersal from a single source, has been undermined, yet the consensus interpreting Chavín iconography as religious remains. The design features of the Chavín monumental architecture have their origins in coastal sites. Chavín's building style is unique and synthesized. Chavín's Old Temple, the initial monument, combined the architecture of the central coast U-shaped pyramids and the north-central coast sunken circular court, a synthesis that was seen earlier at Sechín Alto. Some of the iconography at Chavín is found in the clay friezes on the earlier coastal monuments. The antecedent for low relief stone carvings decorating the monument exterior dates to 1200 BC at Cerro Sechín in the Casma Valley. After 500 BC decorated cylindrical columns, an architectural element from the northern highlands, were added. What was the function of Chavín? Hundreds of decorated ceramic vessels for eating and drinking evidence group feasting. The pottery includes items created hundreds of kilometers from the site, indicating possible usage by distant communities. Coastal mussels and fish were found with the pottery, further evidencing distant contacts. Chavín art is basically naturalistic, lacking in political content and devoid of historic personages or scenes. While the consensus is for a religious function, Karen Olsen Bruhns writes that "There is little direct evidence concerning Chavín religious beliefs or practices..." There is also little direct evidence of political function. It seems that the preeminence of Chavín de Huantár continues to be exaggerated due to, first, the early misidentification of Initial Period iconographies as Chavín, second, the need to use stone in the highlands resulting in differential preservation, third, the sequence in the discovery and investigations, fourth, changes in available methods, particularly radiocarbon dating, and fifth, the presumption of a Chavín religion. Interaction and exchange seem adequate explanations for the developments at Chavín in such an economically significant location. The significant increases in trade parallels the chronology at Chavín, therefore I see exchange during the Early Horizon as a very plausible explanation for the diffusion of a universalist iconography and art style. During the third century BC a disintegration of the Chavín interaction sphere is evidenced by halting of construction, replacement of Chavín style ceramics by local styles, widespread construction of hilltop fortresses in the highlands and coastal valleys, a decline in interregional trade and intensified socioeconomic stratification. Two centuries after Chavín's fluorescence the hypothetical civilization waned. Burger, Richard L., 1981. The Radiocarbon Evidence for the Temporal Priority of Chavín de Huantár. American Antiquity 46:3, 592-602. Burger, Richard L., 1988. Unity and Heterogeneity within the Chavín horizon. In Peruvian Prehistory, Richard W. Keatinge, Ed. Cambridge University Press. Burger, Richard L., 1992. Chavin and the Origins of Andean Civilization, Thames and Hudson, London. Burger, Richard L., 1992. The Sacred Center of Chavín de Huantar, in The Ancient Americans, Art from Sacred Landscapes, Edited by Richard F. Townsend, The Art Institute of Chicago, Prestel Verlag, Munich. Druc, Isabelle C., 1998. Ceramic production and distribution in the Chavín sphere of influence. Oxford. Fung Pineda, Rosa, 1988. The Late Preceramic and Initial Period. In Peruvian Prehistory, Richard W. Keatinge, Ed., Cambridge University Press. Lanning, Edward P., 1967. Peru before the Incas, Prentice-Hall, Inc., Englewood Cliffs. Moseley, Michael E., 1992. The Incas and their Ancestors, Thames and Hudson. London. Olsen Bruhns, Karen, 1994. Ancient South America, Cambridge University Press. Pozorski, Thomas and Sheila Pozorski, 1987. Chavín, The Early Horizon and the Initial Period. In The Origins and Development of the Andean State, Edited by Jonathan Haas, Sheila Pozorski and Thomas Pozorski, Cambridge University Press. von Hagen, Adriana and Craig Morris, 1998, The Cities of the Ancient Andes, Thames and Hudson, London. astronomical latitude placement of significant ancient monuments. The Chavin latitude sine equals one-sixth (9.5941° sine = 0.1666...). A right triangle at Chavin with sides extended to the pole star and to the geodetic center expresses the ratio 1:6; the axis is the hypotenuse equaling six and the geodetic radius equals one. Latitude properties expressing integral number relationships to the pole and equator reinforce astronomical observation interpretations of major monuments. Today, a precise sine one-sixth geodetic triangle intersects the latitude of Building F. Secular polar motion has shifted local latitude slightly since construction. © 2001 James Q. Jacobs. All rights reserved. Published Jan. 1, 2001.